A reminder to everyone that Jersey City will be imploding the Montgomery Gardens Housing project on Saturday, August 29th at 9:00 a.m. Streets around Montgomery Gardens will be closed to pedestrian and vehicular traffic from 6:00 am to noon. The city recommends that everyone in a two block radius close their windows. I would recommend that everyone in our district also close your windows. We may be a bit further away but it will be a significant implosion and if we happen to be caught downwind some of the residue could spread. If you want to view the implosion the city has set up a viewing section at Fremont and Bright Streets. It is recommended that viewers arrive by 8:00 am. Earlier this week Jersey City Mayor Steven Fulop announced that the city is freezing approval for any non-essential PSE&G repairs. Many residents have complained that when PSE&G repairs its infrastructure, it does not adequately restore the roads once its work is done. A new city law, adopted by the city council in January requires that contractors who work on roads that have been resurfaced in the last decade resurface the roads “from curb to curb … as per the municipal engineer’s standards” when they complete their work. Crosswalks must also be restriped and brick crosswalks restored. If you have any concerns about work being done on roads in your neighborhood, do not hesitate to contact your representatives, including your county committee representatives. Ward E, District 6 residents (or anyone else if you are uncertain who your representatives are) can contact me through this online form with any questions. 9/21/2015 UPDATE: Jersey City and PSE&G have reached an agreement on a repaving schedule for city streets. Repairs have resumed. The Jersey City Youth Foundation is a non-profit organization that seeks to enrich cultural, educational, and recreational opportunities for Jersey City youth. Currently the Foundation is seeking to raise funds to provide a new backpack, with school supplies, for every K-12 student who asks for one. On Tuesday, August 18th, the Foundation will be hosting a Whiskey and Barbecue Tasting from 6:30 to 9:30. It takes place at Smokin’ Barrel located at 1313 Willow Avenue in Hoboken (yes it’s Hoboken, but the owner is a Jersey City native). To purchase a ticket or make a donation click here. 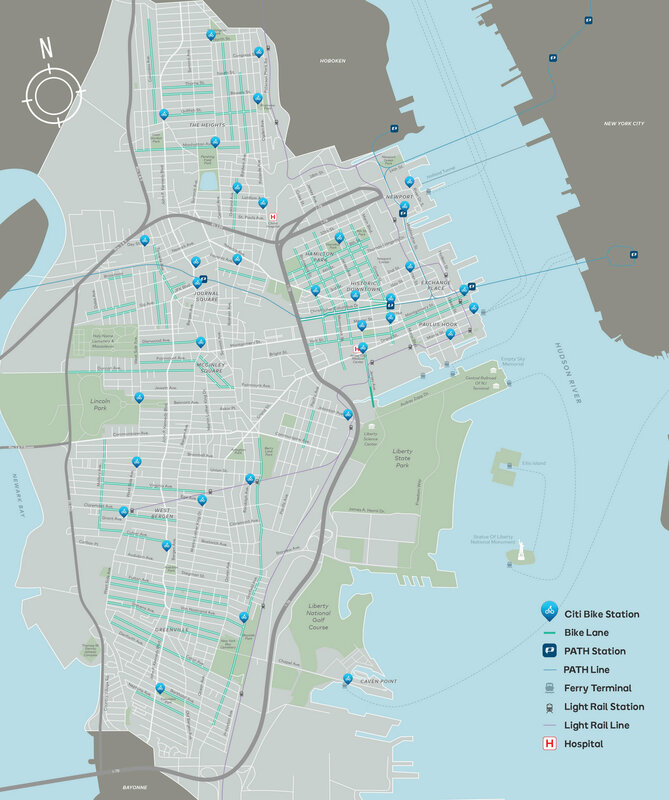 Jersey City has unveiled the locations of its CitiBike locations. The city will start with 35 bike stations and will include locations in each Ward. This is in contrast to how Citibike was rolled out in New York City. New York’s locations are concentrated in Manhattan and a few neighborhoods in Brooklyn. By contrast Jersey City will have at least one station in almost every neighborhood (although Downtown will have the most stations with a total of 13). The Jersey Journal has published a map of the bike stations here. The Jersey City Independent has published its August Event Roundup. Throughout the month there are plenty of local activities you can do that are free or nearly free. Thanks to the Jersey City Independent for living up to its name and providing an independent perspective on Jersey City affairs. KEMSCO supporting trench access for UTEC. KEMSCO working roof modification on MH 2-1. Completed roof opening, need to make modification. Road Plates, cones, drums, signs protect work zone. UTEC installing last section of 10” steel conduit connecting MH 1-7 to 2-1. Completed. UTEC needs to install 185’ of 4” PVC (Complete Wednesday). UTEC splice crew 24/7 splice activity. KEMSCO framed out for control cabinets. Weld crew @ WEY fabrication recirculation piping for MH 1-2. Remaining footage to install 126’ of 6”, 10”, 4”PVC. UTEC is set up to complete steel conduit installation by EOB Wednesday. Welded pups on 6” & 10” Steel conduit. KEMSCO excavating for power supply for SJ Control Panel. Excavate for Richmond for core drilling for oil control piping to control panel. UTEC bent & installed 6” X 70’ steel conduit. This completes tie-in of steel conduit from MH 1-3 on Van Keuren to 1-4 Salerno lot on James Ave. Approximately 140’ X 2 of 4” PVC, 90’ of first lift of backfill, 140’ of 2nd lift of backfill, and 140’ of asphalt. Installed 50’ of 6” Steel conduit. Installed 50’ 10” steel conduit. Installed 180’ X 2 of 4” PVC. KEMSCO back filled & paved to grade 100’ of roadway up to west side of MH 1-7. Excavated 75’ of trench towards Summit. Remaining steel conduit to be installed. 310ft 6” pipe left to be installed. UTEC welded on a pre-bent 50’ length of 6” pipe to existing run. KEMSCO back filled & paved to grade 60’ of road way. St Pauls is paved completely. KEMSCO supported UTEC with trench access on JFK. Trenched app. 85ft towards Summit Ave.
Back filled and paved to grade 130ft of road way. 370” of 6 & 10” steel conduit remaining to be installed. KEMSCO back filled & paved additional 35’ on roadway. Half of ST Pauls intersection is paved to grade. UTEC bent & welded 25’ section of 10” steel conduit. Cut back, welded pup, bent & welded a 50’ X 6” steel conduit. And JFK BLVD and East on Newark Ave.
And JFK BLVD back fill & paved to grade 75ft of roadway.